After making its mark in Maximum City, Indigo Deli is all set to become Delhi brunch destination. While the interiors are understated, the seating is comfortable and deli-like, complete with chalk boards, no-fuss chairs and tables. When weighty brands make their way to the capital, word spreads faster than butter. Indigo Deli has a formidable Mumbai reputation to live up to, and its Delhi outpost has - in its first week - managed to make some serious fans. Owner and chef Rahul Akerkar and wife Malini have put a lot of hard work into making this outlet what it is. While the interiors are understated, the seating is comfortable and deli-like, complete with chalk boards, no-fuss chairs and tables. First looks aside, your experience here is defined by the attentive service and heart-warming food. We began with the deli house salad, which had a generous portion of seafood-from house cured salmon to poached lobsters-caper berries and green beans tossed in lettuce with juicy tomatoes and baby potatoes for company. The oregano vinaigrette dressing was the perfect summer accompaniment to a simple yet effective starter. You must absolutely try the BBQ pork ribs with buttered cornbread-sticky, moist, falling off the bone and delicious. Only complaint, after the first few, the sweetness of the sauce begins to cloy, so maybe they could go easier on that. 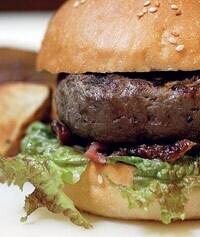 For mains, the burgers came highly recommended and rightly so. The blackened salmon burger had the right proportion of char vs flakiness. Ditch the bun and dig into the salmon fillet by itself and be wowed. Similarly, the tenderloin steak was so exactingly prepared that it did not need a sauce to dress it up. 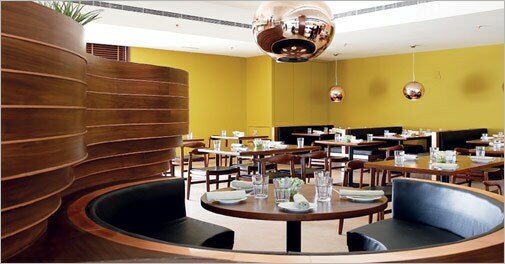 Indigo Deli stands out owing to the quality of produce being used, and having a celebrity chef at the helm also helps. Now, I was told that the home-made ice creams, the cheesecake and eggs Benedict are absolute must-trys, but we decided to save them for another day. The breakfast menu is fairly elaborate, and one can easily see this place becoming a Sunday brunch favourite with Delhi's in-crowd as well as those who crave a slice of gourmet Mumbai.